Priyanka Yoshikawa is the new Miss World Japan 2016 at the grand finale held on 5th of September 2016. She will represent the land of the rising sun at the forthcoming Miss World 2016 in Washington DC, USA in December. 22-year-old elephant trainer's licence is the first Miss World Japan of Indian descent! 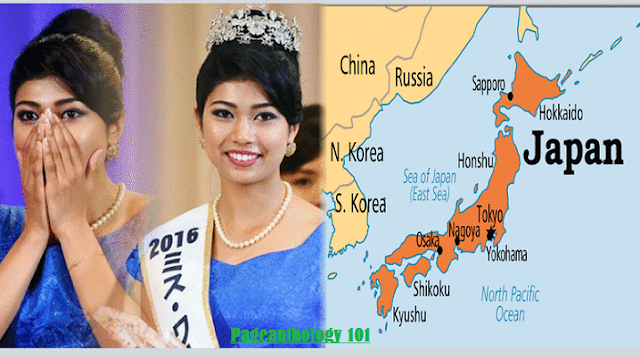 Yoshikawa, who speaks fluent Japanese and English, was born to Indian mother and Japanese father, has just won the coveted title and try her best to be the first Miss World from Japan and the second Priyanka to be Miss World after the legend Priyanka Chopra of India. The Japanese model stands at a stunning height of 176cm. Priyanka bested 30 other Japanese girls to clinch the coveted title. First runner up position was given to Misato Makino while Natsuki Robertson was named second runner-up and Yamashita Himawari finished as third runner-up. "Yes, I'm half Indian. But that does not mean I'm not Japanese"
Priyanka Yoshikawa's surprising victory comes a year after Ariana Miyamoto faced an online backlash for becoming the first black woman to represent Japan in Miss Universe last year. Social media lit up after Miyamoto's victory as critics complained that Miss Universe Japan should instead have been won by a "pure" Japanese rather than a "haafu" (the Japanese for "half", a word used to describe mixed race). Miyamoto was named one of the top 10 finalists in Miss Universe 2015 where Pia Wurtzbach of the Philippines was declared as the winner.